This is by far my favorite pancake recipe. It is super simple to make, has only 4 ingredients and completely satisfies my need for pancakes. I have eaten this for dinner a few times and then went to the gym – I was surprised at how awesome I felt while I was working out! Thank you www.ibreatheimhungry.com for posting such AWESOME recipes! Melt the cream cheese in the microwave for about 25 seconds. In the same bowl, mix 2 eggs and 1/2 tsp cinnamon – mix well. Pour 1/3 of the batter into a hot pan greased with butter or pam spray. Cook for 2 minutes until golden, flip and cook 1 minute on the other side. Repeat with the rest of the batter. 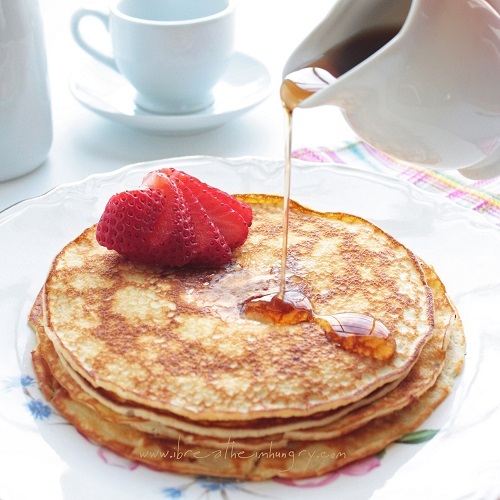 Serve with sugar free syrup (or any syrup of your choice) and butter.